PicoWay Tattoo Removal at Séchoir treats multi-colored tattoos on different skin types while utilizing unique picosecond laser technology to deliver fast, comfortable treatments – more than any other traditional laser tattoo removal solution available. Call today to schedule your first treatment. Picoway is an advanced laser solution for benign pigmentation such as freckles, age spots, lentigines, Nevus of Ota, Café-au-Lait and more. This breakthrough technology uses ultra-short picosecond (trillionths of a second) pulses to break down the pigment into the smallest particles. What PicoWay Tattoo Removal does? The PicoWay laser light is targeted at colors matching the specific laser wavelength in ultra-short picosecond pulses. These pulses shatter the tattoo ino into very tiny particles, which are then easily eliminated by the body’s natural processes. The PicoWay laser emits less heat energy than traditional lasers providing a safer, more comfortable treatment for ALL skin types, with fewer side effects. How many PicoWay Tattoo Removal treatments do I need? 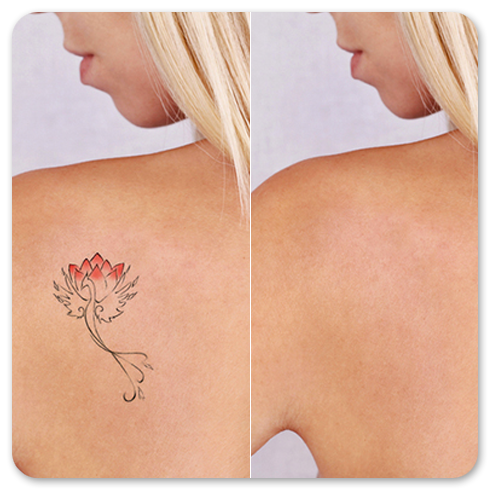 The effectiveness of the treatment depends on many factors such as the age, location, depth, size and type of tattoo. All tattoos will require several treatments for optimal results.